There’s a link between all of the members of Space Elevator , apart from the fact that they’re all very good musicians (and I always include singers in that category); all of them have, at some time, been involved the Ben Elton/Queen musical, “We Will Rock You” which played for twelve years at London’s Dominion Theatre before closing in May of this year. I know that some music fans are pretty sniffy about musical theatre, but the fact is that you have to be a very, very good (and consistent) musician to play in such a high-profile production as this. So, what I’m saying is that the five members of Space Elevator are musicians of the highest order and, putting “We Will Rock You” aside, they have worked with some of the biggest names in modern music. Space Elevator comprises The Duchess (vocals), David Young (guitar), Neil Murray (bass), Elliott Ware (keyboards) and Brian Greene (drums) and their first album “Space Elevator” is out now and, in the best possible way, it’s what you would expect from a group of musicians with their background and experience. The songs are well constructed, the performances are all faultless and the whole album is underpinned by sense of theatricality and fun that’s so often missing from serious (or po-faced and pretentious) rock albums. And, there are quite a few segues from one song to the next, so don’t even think about listening to it on shuffle. It’s not too difficult to pick out reference points either, musical and lyrical; “We Are the Losers” features layered Brian May-style guitars, massed vocals and changes of tempo and instrumentation before the music hall piano leads into the anthemic finale and straight out into “I Will Find You (Gallifrey Dreams)”. This epic pop ballad provides a musical setting for the Dr Who/Rose love story, opening with gently picked acoustic guitar and close-miked vocal and building up to a chorus with a great guitar hook and The Duchess’s vocal cords set to stun. The album’s first song “Elevator” and “More Than Enough” both use highly processed spoken intros representing an automated lift voice and radio announcer respectively, while “Little White Lies” and “We Can Fly” rely on tempo changes to keep the attention focussed. Lyrically, the album is shot through with the theme of looking to the future, which forms the basis of “Move On” and “Really Don’t Care” and also pops up elsewhere. The Duchess even has a “Killer Queen”-style Freddie Mercury moment with “Oils and Bubbles”, featuring the memorable lines: ˊI’m so clean, scrubbed to a sheen, I’m a total hygiene queen; it’s the only way I’ll be bedded, to cleanliness I’m totally weddedˋ, which wouldn’t sound out of place in “The Rocky Horror Show”, but fits perfectly with the high camp of the piano backing, the guitar solo and the layered backing vocals in the chorus. 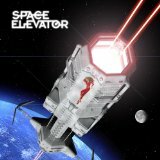 “Space Elevator” isn’t an album that will allow your attention to wander; you’re never more than eight bars from another surprise, whether it’s a tempo change, a guitar fill, a breakdown or an unexpected segue into the next song. The rock purists will object to the theatrical elements and the production, but if that bothers you, then stick to Dumpy’s Rusty Nuts. Throughout the album, The Duchess’s dynamic range is matched by superb playing and arrangements full of hooks which just won’t quit. Go on, you know you want to. Out now. Available from Amazon and the band’s website.